What is necessary to bring the day of my flight? 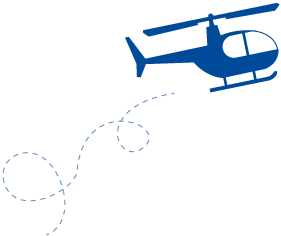 The passenger must present to the heliport 20 minutes in advance and must show the ID or passport. Is a minimum of passengers required per flight? No, the flight is exclusive. They can fly 1, 2, 3 and up to 4 people depending on the itinerary and the helicopter. Yes, except children under 2 years. Minors must always fly accompanied by an adult. What objects are not allowed to climb into the helicopter? Liquids such as colognes, soaps or creams will be limited to individual amounts of 100ml. They may express preferences, but due to safety reasons, the mechanics and the pilot will decide the final distribution. Can a user change the flight date? Yes, as long as the ticket purchased is not by offer or discount. In these cases, the user could not change the dates. What if it’s a bad day on my flight? In case of bad weather we must cancel the flight for safety reasons. Of course the flight can be carried out another day or we will refund the amount in case it is not possible. Can you hire a flight for more than 4 people? Yes, but you should contact the Company through the telephone 937 304 911 or the email [email protected] indicating your claim. Can I fly to destinations that do not appear on the web? Yes, but in these cases you should contact the Company through the telephone 937 304 911. No, our pilot will be in charge of answering all your questions. Can people with reduced mobility fly? It depends on the case. It should be notified at the time of booking and then it will be seen if possible. What is the maximum passenger capacity in the helicopter? Between 4-5 passengers, depending on the weight of these and the helicopter. What is the maximum weight per passenger? The maximum weight per passenger is 110kg. In case of exceeding this weight, the passenger must notify it during the reservation. Can the Company suspend a flight? Yes, for safety, airspace restrictions, weather and operational incidents. In that case, you can choose between changing the day, refunding the ticket or performing the transport service with terrestrial means.